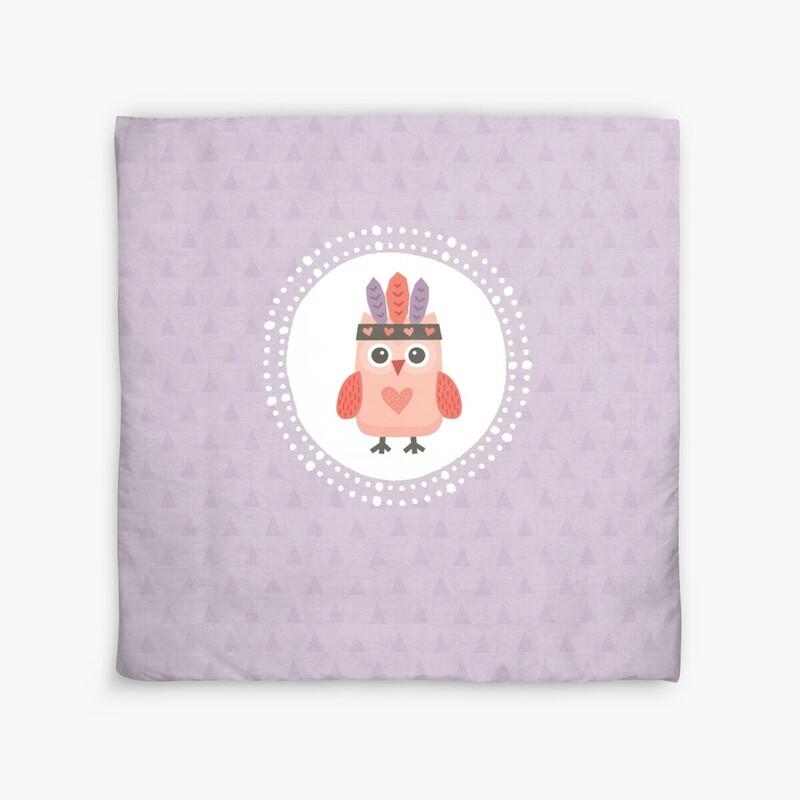 With the launch of our new Duvet Covers, many Redbubble artists will be flocking to Photoshop and beyond to create or adapt designs into an exciting and cozy blanket for their customers, friends, families, and themselves. We turned to a handful of some of our best artists for tips about making work that functions as a one-of-a-kind household item that can totally tie rooms together into complete and colorful packages. Read below about the best practices for making gorgeous duvets that will make any home or dorm room a little more unique and creative. Personally, I love something with great color and pattern that’s a little bit crazy ~ something that will make the bed the focus of the room. I don’t get too hung up on matching stuff in my house ~ I like busy and eclectic artsy chaos. Having a bright fun duvet cover and some clashy throw pillows is homey to me. Not that I don’t admire perfectly coordinated spaces… it’s just not me! What’s one piece of advice you’d give to an artist who is attempting to design a duvet cover? Patience (these are BIG files). This is not a throwaway purchase… be precious with what you create. I use several design tools when creating my art. Many of my designs start as ink drawings that are scanned and played around with. Once I have a repeating file created, I use Photoshop to tile the design to the largest size duvet cover and crop from there. I’d say something themed, with an attractive colour scheme. A solid repeating pattern always looks amazing on a duvet cover! Have you altered any of your current work so it would would work better on a duvet? The templates for duvets are very large (and rightfully so) – I had to think about repeating my work and making patterns out of my designs, which I’d never really done before. It’s a bit of a challenge, but a valuable skill to learn! Also, I altered some of the colours to make them more bedroom-y, and added an interesting background too (such as spots or stripes). The whole design has to be interesting, as you need to consider people will be looking closely at the duvet as they’re snuggling into bed! What is your tool of choice when designing for duvets? For my designs, I actually tend to use the free downloadable program GIMP! Despite its silly name, it’s great. I also have Photoshop which I’m a bit intimidated by – but it’s brilliant for duvets as you can create repeating patterns easily! Even I managed to work it out after Googling a few tutorials. 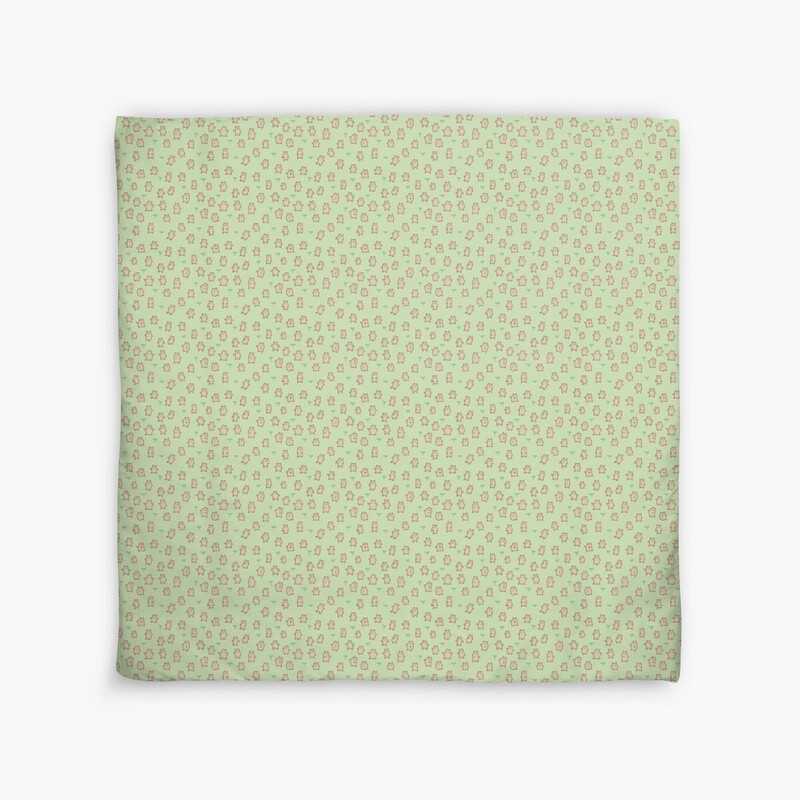 So, if you’re better with Photoshop than I am (which no doubt you will be), I’d definitely recommend it for creating lovely pattern-y duvets! A bedroom should be a calm, inviting, peaceful place, and the duvet will be a focal point in what should be the most restful room in the house. 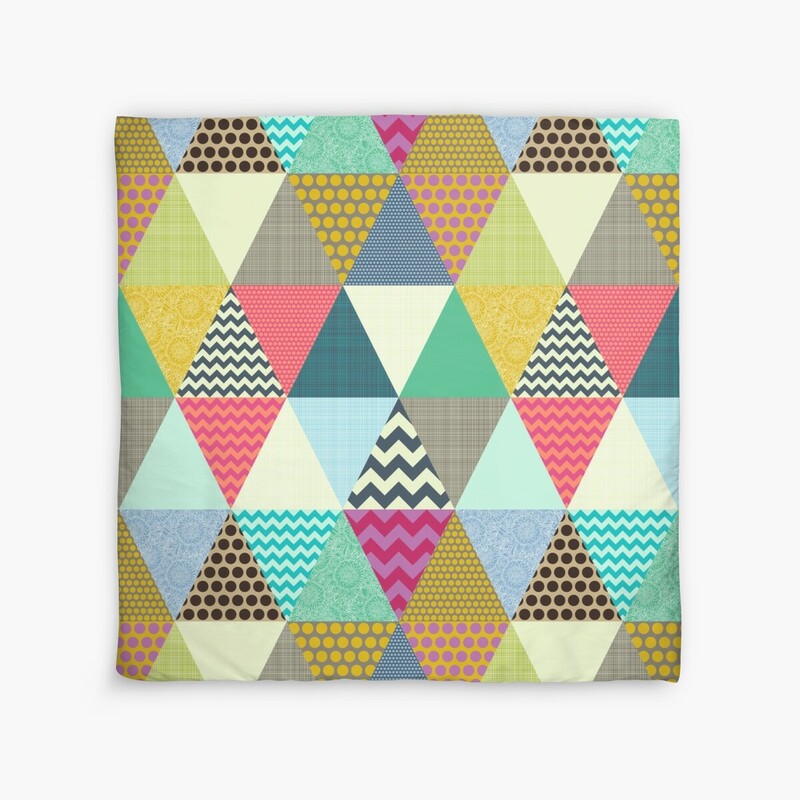 So a great duvet cover design won’t be overpowering or jarring. The design and color palette can be soft and muted; fresh and uplifting; or bold, vibrant and dramatic – but harsh color clashes should be avoided, as well as visually unsettling patterns like optical illusions. Buyers will need to co-ordinate their new duvet cover with existing bedroom furnishings, so we need to bear in mind that our design or artwork will have to work in with many other elements in the room. Keeping things simple will make our design more adaptable and therefore more appealing to buyers. Designing for something as large as a duvet cover means scaling up – small details and mini prints will lose impact over such a large surface area. Yes, for sure. I’m scaling my designs up for the duvet covers, and in some cases that will mean I need to add texture or subtle patterning to create interest. Also, not all of my patterns are seamless, so I will have to recreate some of them in seamless format so I can repeat them across the duvet cover. Large scale designs often look better with a reduced colour palette, so I’m considering recoloring some of my designs to simplify them and make them look fresh and crisp. For now, the underside of the duvets will be a neutral off-white colour, so I’ll be bearing that in mind as I rework my colour schemes. A related colour issue concerns pillowcases – initially at least, matching pillowcases will not be available, so buyers will need to source these to match our designs. A final consideration will be the edges – in some cases I will need to add a margin around the edge of the pattern or placement print to allow for bleed and accommodate the various templates. Imagine your design on a real bed in a real home! I think it’s a good idea to keep reminding ourselves that a duvet cover has a different job to do than, say a framed print on the wall, or even a throw pillow. The painting and the throw pillow are features, designed to draw attention and “lift” a room. They can be moved to another room if we get bored with them, or feel they don’t quite work where they are. The duvet cover has to stay in the bedroom, and it has to work in with the existing soft furnishings. So we need to bear that in mind when we choose our colour palette and create our designs. I start with a sketch and then move to Adobe Illustrator to set up large scale works. I love Illustrator because vector files are small and manageable, and can be “stretched” without pixellating. Wrangling large scale images with multiple layers in Photoshop can be a slow business, so I leave that until last and use as few layers as possible, flattening as I go to speed up the rendering. Need more info about designing duvets? Check out this helpful tutorial on how to make a great repeat pattern for a duvet cover. And if you need more help, have a look at our FAQ. Do you have any tips for creating a great duvet cover? Share them in the comments below.